New York, US (BBN)-David Bowie’s final album has reached the number one spot in the United States, a feat he never managed while he was alive. Blackstar, which was released two days before he died on 10 January from cancer, beat Adele’s 25 which had topped the chart for seven weeks, reports the Sky News. Bowie also joined the small rank of artists to have two albums in the top five, with his greatest hits collection Best Of Bowie, released in 2002, hitting number four. Blackstar, which came out on Bowie’s 69th birthday, had immediately won critical acclaim for its experimentalism as the long-reinventing artist developed a dark, hard jazz sound. His death threw a whole new light on Blackstar as it emerged that he intended the album as a final statement, full of meditation on a half-century on the cutting edge of music. Especially poignant was the video for Lazarus as Bowie levitates from a hospital bed and returns into a dark closet. Bowie spent the final two decades of his life living in New York and had said that his first love was African-American music, especially funk and soul. Yet while Bowie cast a huge influence over US pop culture, he was generally considered an avant-garde artist and did not win the same mainstream success as in Britain and a number of other European countries. 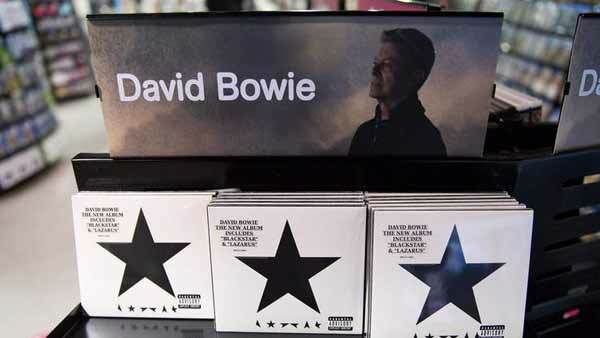 Blackstar also opened at number one in Britain, where it was Bowie’s 10th chart-topping album. In the United States, Bowie had gone to number two with his previous album, The Next Day, in 2013 and reached number four with his pop-driven Let’s Dance in 1983. Bowie first lived in New York in the early 1970s before spending 10 months in Los Angeles where he famously said that he survived on a diet of red peppers, milk and cocaine. Seeking a respite from drugs, Bowie returned to Europe and experienced some of his most creative years in West Berlin. Since his death, the sidewalk outside his Soho penthouse has turned into a shrine of flowers and glitter.